How many of you have had trouble with screen burn-in on your Imac? Discussion in 'iMac' started by Whackintosh, Mar 11, 2009. It seems this has been a major problem for many Imac users, but I don't see many complaints about it here. Has your Imac developed ghosting or burn-in issues? I haven't had that with any of my computers. I thought those were gone with the days of CRTs. Turn if off for a bit or leave a screensaver running, and it goes right away. Modern LCD has no screen burn in unless you rarely do anything to it and don't have screen saver. I believe "burn in" in this context is a temporary thing. I have read where those that do a lot of photo editing and are very particular about their screens report residual image/artifacts "burned" into their LCD screens. Supposedly if you go into the desktop settings and change your screen background to all white, then take it back to what you once had, this "burn in" effect goes away. This is unlike CRT screens where the burn in is permanent. When you screen burn a new imac - or any new computer/monitor for that matter - it is simply mother nature telling you to get outside! Go for a hike, come back, all better. This only happens if you spend 24/7 with the iMac on at all times for like 10+ years. Never happened to my first LCD display, a 17" Samsung. And I'm still using it (my dad actually). This statement is further from the truth. My late '07 Aluminum iMac is recently experiencing burn-in, and it occurs after a few minutes perusing sites such as MR and Yahoo. I didn't have it on 24/7 over the last few years, so you're out of line. Luckily, I have Applecare, so this computer is going in for repairs next week. That looks a lot more like dirt than burn-in. Maybe a silly question, but have you tried just cleaning your screen? I have a 3-4 year old 23" cinema display and I have the same issue, a definite burn line up where the navigation bar is... actually the shadow under the navigation bar is what is permanently there... I think it must have something to do with the fact that that shadow is always there while I work... I do work a lot BUT the screen saver comes on if I am not working or on the phone for more the 15 minutes. Now for the strange part... I also see windows and text of some kind burned into the middle of the screen BUT it is only noticeable on certain neutral background colors... if I open PS and create a large field of color and change that to a dark/medium grey the burn becomes very obvious. I was under the impression this would not happen on LCD but this is definitely happening... perhaps it's not called "burn" with a LCD but it is definitely there. I heard about people fixing it and noticed that above there was a way by going all white and setting it back... I am about to try that now. The white screen trick noted on a previous post worked like a charm but I noticed that it comes back right away if you leave a window open... within minutes... something about high contrast sticking around as some sort of remnant. Check for yourself... if you set the background to one of the darker grays in the solid color pallet they appear... clear it by setting the color to white, then back to grey and keep an open window in place for 5 min... move it over and you see a subtle impression of it on the grey background... wild! I did notice that I do have some sort of permanent dark line through the center of the top nav bar and a slight staining coming down from the top in a small 3/4" area but these areas are are not in the way so no big deal. Anyone see the same issue? OK, last one... I just watched one of these impressions fade away very slowly. It's gone w/o the white screen trick. I guess it's a temporary effect but not cool if you are working on something close up... any idea on how to stop this? Is it on all LCDs? I suppose not using a grey background will make this a non issue, still interesting. How come only Newbies have "burn in" problems in this thread? Is it permanent? In most cases NO. Thus it's not burn in. I think what most are referring to IR (image retention), not burn in. Burn In is permanent and cannot be fixed. IR on the other hand, is temporary and can usually be fixed by running a white screen for a short period of time. Calibrating your monitor from the factory "torch mode" will reduce the chance of getting IR, too. Just a suggestion. I have a Rev. A iMac, 24", 2.8 Extreme. The iMac is on 12 hours a day, 7 days a week or more, and I have 'yet' to see this issue. All is good here! today we call "burn in" image persistence. It does still happen sometimes. I have read that it is more likely to happen if your LCD gets hot. 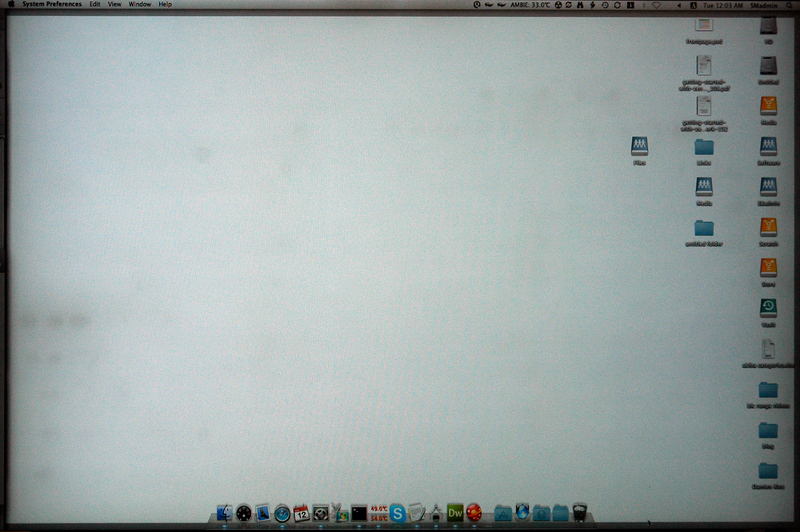 I have a 20 inch HP display that is S-IPS, there is image persistence along the top menubar. It is not there when I turn on the display, but within minutes it will show up. I sometimes hide my menubar with an app called "Present your apps" (or something like), and i can see the image persistence of the menubar and the Apple icon/file/edit/ect. It also happens to get quite physically hot along the top edge of my display. For me, I think this is more an issue with my display getting too hot and exacerbating the problem. The always-on menubar might be part of the problem also. I've thought I'd seen something before, but today - wow! one is a solid grey desktop background - look at the stuck image! you can read the words actually. damn I need to sort my screensaver settings? powered off for 20mins but no difference - any suggestions?